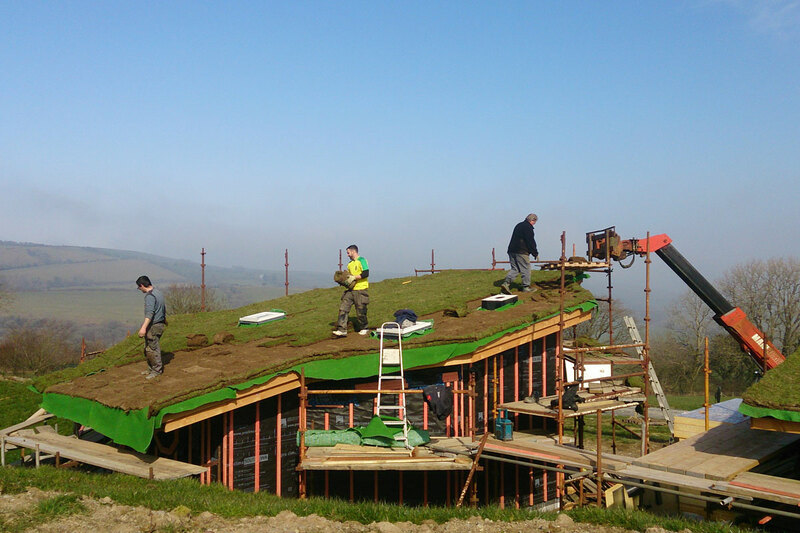 The project was to build two small eco-friendly houses that would provide self-catering glamping holidays at Treberfedd Farm in West Wales, expanding the success of the farm’s existing holiday cottages. 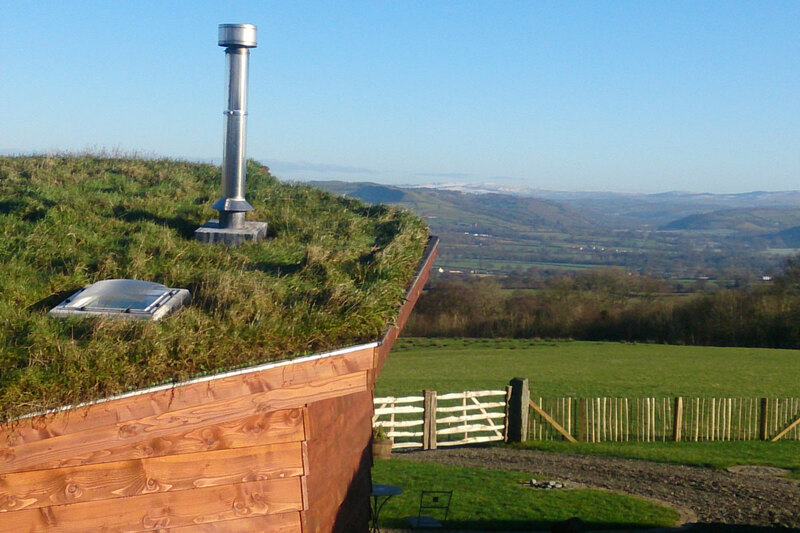 A hilltop site on the farm was chosen, to give the houses spectacular 300 degree views of the Aeron Valley and surrounding hills. An original design for the buildings was created by farmer Jack Cockburn and architect Huw Davies. The aim of the design was to blend the houses into the landscape, to make the most of the beautiful views from the interior, to use natural materials and to create a circular feel to the interior that flows. The overall effect would be of a peaceful rural idyll, a perfect setting for glamping in Wales. 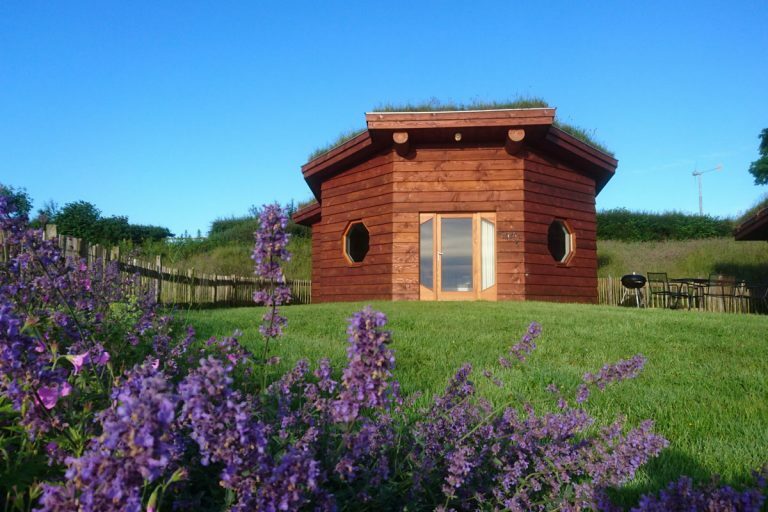 The eco cabins have grown, almost mushroom like, out of the field. They are sheltered from the prevailing south westerly winds. Large octagonal windows face the rising sun and look down the valley to the East. Rustic wooden fencing and handmade oak gates encircle the hobbit houses and their gardens. The approach to the houses is through a green field. An orchard has been planted as part of the development and the farm’s sheep graze the field in front and the grassy banks behind the houses. 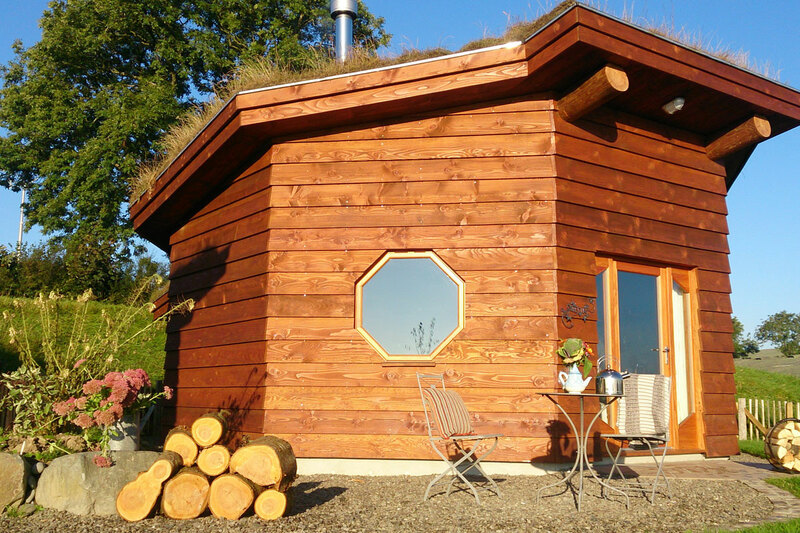 The design is completely unique, a striking blend of hobbit house, log cabin and roundhouse. Scots Pine trees were carefully crafted by local craftsman Steve Gates into the impressive timber structure that holds up the roof and walls. Sixteen trees, visible from the interior, hold up the roof. They are arranged to make an eight sided octagonal house. The octagon creates a circular feel to the space inside. The timber beams are visible from the inside complete with hand crafted oak pegs that hold the building together. 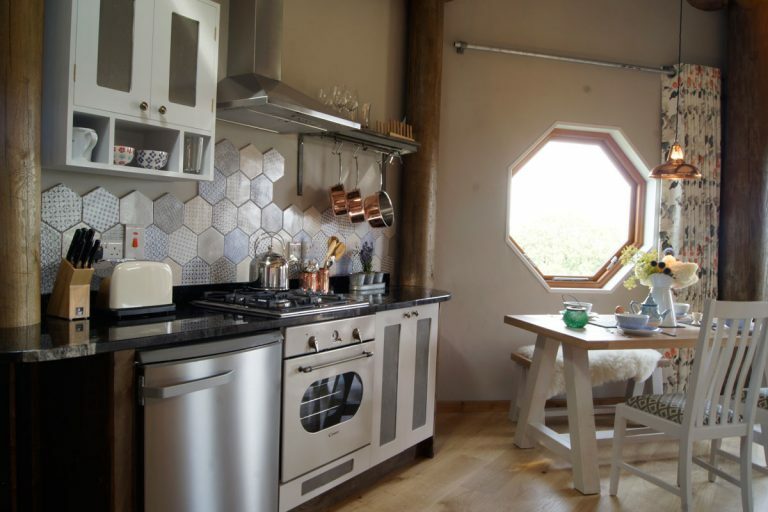 The challenge for Cream and Black interior design was to take this raw, sculpted, octagonal space and fashion it into an interior that was striking in design and comfortable to live in with the originality to make a truly memorable glamping holiday experience. Hannah and her team at cream and Black had to use all their ingenuity to pull it off. Every detail was planned carefully . The project threw a lot of challenges in their path but the creative team navigated them with good humour and inventiveness. Hannah’s design and the scrupulous attention to detail and craftsmanship of builders Euros Lewis Ltd ensured the finished product is a very high quality, neat little house indeed. The end result is an extraordinary modern rustic interior with beautiful use of contrast and harmony. Hannah and the team achieved this by careful selection of colour, fabrics, and of materials in wood, stone and metal. 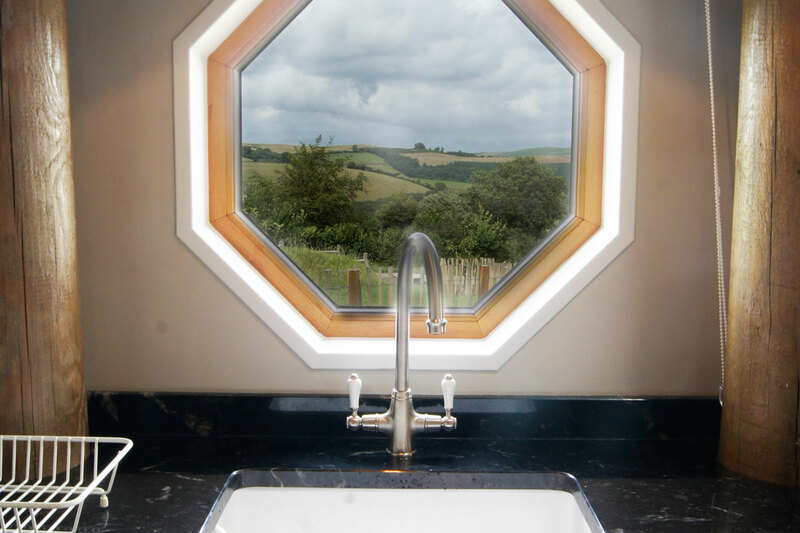 Cream and Black brought the elements of architecture and design together to present the eco cabins as they should be seen –little ‘jewels of the mountain’ or ‘Tlws y mynydd’ in Welsh!